Art Zone STEAM Preschool introduces Science, Technology, Engineering, Arts, and Mathematics to students using fun hands-on projects. Art Zone’s unique STEAM curriculum blends science, arts and math to engage students, encourage their creativity and feed their curiosity and learning. Your child will learn complex & creative thinking; building life long neural patterns in their fast developing brain. Art Zone STEAM curriculum is designed in collaboration with Katherine Simon, engineer and CTE credentialed LAUSD teacher and Laura Krug, MA and founder of Art Zone. All our lessons are based off of the California education standards and led by trained educators. 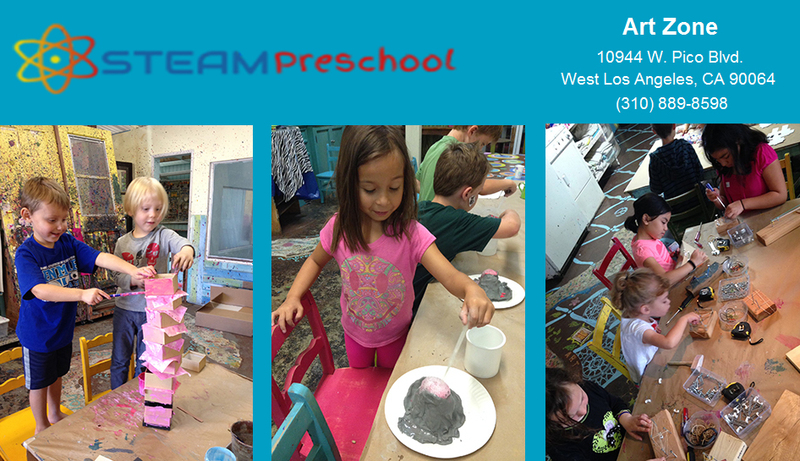 Art Zone’s STEAM curriculum, includes all of Art Zone’s signature Art-Play experiences which engage your preschooler in creative, messy, and artsy learning! Students have the opportunity to stretch the limits of their imagination by utilizing our unique spaces like our water room, indoor play area, and art stations. Through various guided and group play activities they will build peer relationships and learn fundamental skills! For ages 2.5 to 5 years old. Sign up for one day per week, two days, or three!
. STEAM: small group work – tinkering, reflection and action plans. One day per week (4 classes)= $240.00/month. Two days per week(8 classes) = $460/month. Three days (12 classes) = $660/month. Four days (16 classes) = $800/month. Our enrollment month to month and hassle free. Art Zone STEAM Preschool is available September 6, 2016 to June 9, 2017. Art Zone STEAM Preschool is not offered in the summer. Many families continue by enrolling in our summer camps. Potty training is not required.We collaborate with your family to support potty learning. Please bring diapers and wipes. We have a gentle and loving separation/transition process. “Lovies” and pacifiers are welcome. Students must bring their own lunch. Please do not pack peanut butter or nuts of any kind.